A single slice through a live colony of cells from a genome-edited αα-tubulin–GFP expressing hiPSC line created at the Allen Institute for Cell Science. Membrane and DNA are stained with dyes. Courtesy of the Allen Institute for Cell Science. As a professional society, ASCB helps to define and support the discipline it represents, embracing new methodologies, approaches, and directions, bringing them into the mainstream of its members’ research. In this way, the ASCB has evolved over time from its origins as a society focused on electron microscopy and organelle characterization. Initially this was by recognizing the value of more molecular and mechanistic studies. That was followed by embracing increasingly detailed biophysical and biochemical studies and, more recently, by valuing translational studies linking basic cell biology concepts and approaches to pathology. In addition to the study of model organisms like yeast, flies, and worms, the use of vertebrate cell lines is a major thread in cell biology and a lifeblood for cellular discovery. Most of the research on the structure and function of cells has used a variety of aneuploid or “transformed” cell lines. These studies have led to discoveries that are central to our understanding of cell signaling, cell division, migration, apoptosis, and gene expression, leading to Nobel Prizes for many cell biologists. However, the transformed nature of most of these cell lines, arising from alterations in their genomes and/or karyotype, produces a physiology that can be far removed from the physiology of a normal cell. In addition, the use of these cells does not address their residence in tissue, where they interact with and receive signals from nearby cells. Such cell lines also reveal little about what distinguishes one cell type from another—liver cells from pancreatic cells, for example. A recent ASCB white paper proposed an alternative to these transformed lines, suggesting a pivot to human stem cells.2 In the spring of 2012, the ASCB leadership under the presidency of Ron Vale organized a retreat with several thought leaders in biomedical research to discuss key opportunities for cell biology in the future. One of the themes that emerged was the use of stem cells, in particular human embryonic stem cells, and how the ASCB could best support this new direction in cell biology. This led to the formation of a task force under the leadership of Larry Goldstein and produced the white paper titled “Next Steps in the Stem Cell Revolution: A Report of the ASCB Stem Cell Task Force,” published in 2013.2 This white paper outlined the ways in which centralized production and characterization of modified stem cells would greatly contribute to standardizing protocols and overcoming the barrier to entry for cell biologists wishing to study and use stem cells in their research. This report influenced the planning for the new Allen Institute for Cell Science, which launched at the 2014 ASCB Annual Meeting.3 This Institute, supported by Microsoft co-founder Paul Allen, is using human induced pluripotent stem cells (hiPSCs) to understand and predict cellular behaviors, in both undifferentiated and the differentiated cells derived from them, beginning with cardiomyocytes. It chose this cell type because it is diploid, is pluripotent, grows well in vitro, and exploits the extensive knowledge of the genetics of humans resulting from genome sequencing and expression analyses. 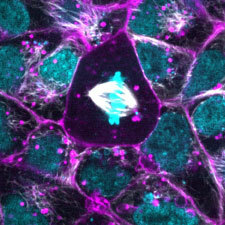 The Allen Institute uses live cell imaging to localize key cellular structures and activities, taking an integrated, systems approach, measuring and quantifying the morphology and relative positioning of the major cellular structures.4 Using these data, it will develop predictive computational models of cell types and states (behaviors), pathologies, and responses to drugs and changes in the environment. Toward this goal, the Institute is preparing a set of genome-edited hiPSC lines with fluorescence (GFP-related) tags in proteins that localize to and determine the morphologies of the major structures in the cell. These tagged lines will be available to the public, along with the other reagents, models, methods, and analysis tools generated by the Institute. Cell identity and plasticity are deeply embedded in stem cell research. Cells were originally classified by morphologic observations of their shape or the organization of a key organelle. On this basis, cell biologists assigned labels such as pyramidal cells, medium spiny neurons, cuboidal epithelial cells, and cardiomyocytes. Pathologic states were similarly identified, most notably for cancer progression. However, the expressed genes and posttranslational modifications and the consequent structural specializations they produce, on both the meso- and nano-scales, are what really distinguish cell types and their states. This understanding lies in the domain of basic cell biology, which studies the transient, localized activities that define cellular behaviors. It also promises new avenues in pathology and personalized medicine, where cell states and types can be inferred microscopically from their organization. Three recent developments suggest that stem cell biology will drive cell biology for the foreseeable future. First, the ability to create stem cells from somatic cells using iPS technology has bypassed many of the regulatory problems that arose from using embryos. It also allows patient-specific cells to be created and used as a “disease in a dish” human model system.5 Second, gene editing technologies, e.g., CRISPR/Cas9, allow the creation of mutations, or the insertion of protein tags, at the endogenous locus—bringing the power of human cell genetics in line with that of yeast genetics. Finally, stem cell biologists are not only creating more and more different cell types in culture; they are also creating organoids, i.e., collections of cells grown in culture dishes that mimic aspects of tissues with increasing fidelity and accuracy.6–8 Although organoids are still in their infancy, it is clear that application of engineering principles over the next decade will create organoids that are closer and closer to the properties of tissues. Taken together, these developments suggest that stem cells will become essential tools in biomedical research. Cell biologists can exploit these technological developments to study interesting problems in cell biology and cell diversity, setting the stage for understanding new genes, cellular principles, and cell behaviors. The basic cell biology of these cells and their derivatives will also inform their medical uses. This kind of understanding will help mitigate repetition of the disasters seen in the early uses of gene therapy, and it is a place where cell biologists must play a key role. In addition, the use of stem cells—diploid cells with relatively stable genomes and karyotypes—addresses the reproducibility issues that have challenged translational research using transformed cell lines. At this early stage, the barrier to entry for most cell biologists may seem considerable, for both technical reasons and cost. However, as more people enter the field, the costs should come down due to both scale and better culture methods. Also, several publicly funded cell banks now have stem cells and mutant lines available for study. The Allen Institute for Cell Science hopes to lower the barrier as well. It is, for example, already distributing its first tranche of gene-edited cell lines, with more to come shortly. These lines are very well characterized and designed to be useful for cell biologists. Finally, the “cell biology of the stem cell” will have a presence at the ASCB Annual Meeting this year with a Saturday Special Interest Subgroup presentation on the Cell Biology of the Stem Cell and, also on Saturday, an Allen Institute–sponsored Tech Talk on hiPSC growth and gene editing, both providing a jump start for anyone interested. 1Hyman AH, Simons K (2011). The new cell biology: Beyond HeLa cells. Nature 480, 34. 4Horwitz R (2016). Integrated, multi-scale, spatial-temporal cell biology—A next step in the post genomic era. Methods 96, 3–5. 5Papapetrou EP (2016). Induced pluripotent stem cells, past and future. Science 353, 991–992. 6Clevers H (2016). Modeling development and disease with organoids. Cell 165, 1586–1597. 7Fatehullah A, Tan SH, Barker N (2016). Organoids as an in vitro model of human development and disease. Nat Cell Biol 18, 246–254. 8Bhatia SN, Ingber DE (2014). Microfluidic organs-on-chips. Nat Biotechnol. 32, 760-772.